My brother Brian, might not be pleased to find out that the Emperor Moth is the subject of a Christmas treat in South Africa. It is a deep-fried delicacy on Christmas Day. That might be more a matter of cultural norms. Catalonia seems to achieve true weirdness: In Catalonia they include the figure of the Cagier in their nativity scenes - a small figure of a defecating man. They also have the pooping log. It is decorated with a face and blanket, and on Christmas Eve the log is placed halfway into a fire and beaten with sticks. I remember the Venezuelan tradition of roller-skating to Mass from last year. And Italy, the heart of Roman Catholicism doesn't have Santa - it has Befana (a kind old witch) on the Fifth of January. No confusing what Christmas is about there. In Guatemala they sweep out their houses, create a huge pile of dirt, put an effigy of the devil on top, and then burn it. In Slovakia, the most senior man of the house takes a spoonful of looks pudding and throws it at the ceiling - the more that sticks, the better. Read all 35 at foxnews.com The lists of weird traditions ranges from 7 to 35 in the internet retrieval list. I am sure there are more than 35. The foxnews article excluded the world's oldest Christmas Tree - it is at Wrest Park in Bedfordshire, planted in 1856. It was planted outside and then potted up each year to be in the house. It is permanently outside now because of its size: a truly weird choice for a Christmas tree - a giant redwood. There's a competing oldest Christmas tree with there world's record. Janet Parker of Chippenham Wiltshire, UK puts up the same artificial tiny pine tree each year, purchased in 1886 - possibly from Woolworths. It fits in a teacup sized pot. And what about the tradition of Christmas cards? What makes it weird? The first Christmas card depicted a small child drinking wine. It was sent in 1843. We know about the New Year's plunge in icy water, but there's swimming in Hyde Park's Serpentine Lake on Christmas morning. Playwright J.M. Barrie donated a prize cup to the tradition in the early 1900's, solidifying its place in tradition. 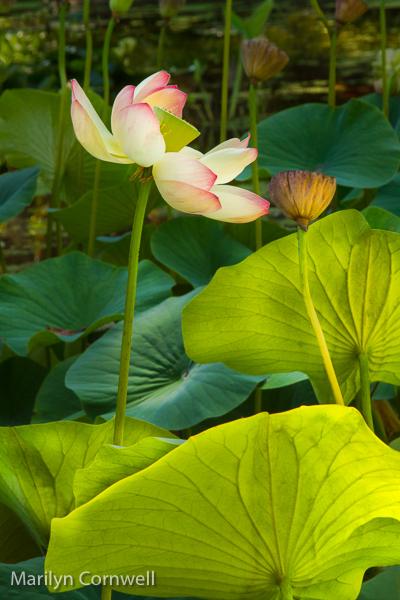 In contrast to all this seemingly crazed behaviour we depict the beautiful Lotus flower today. 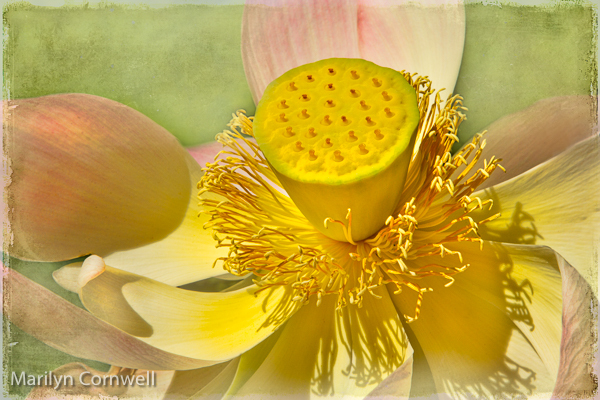 These pictures were taken in the botanic garden Lotusland, in Santa Barbara, CA.